Nothing is more suggestive than spending the holidays immersed in the beauties of Rome. 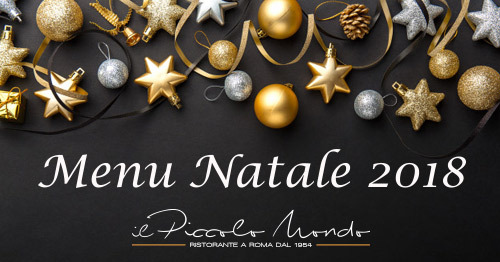 The Piccolo Mondo restaurant has prepared a very special Christmas menu. You can celebrate in an elegant and exclusive location, a few steps from the famous Via Veneto and a short distance from the magical atmosphere of Piazza di Spagna, Via del Corso and Piazza del Popolo. In our restaurant you will find an warm welcome, fine wines and an excellent menu that combines modernity and tradition. To reserve: +39 06 42016034, info@ristorantepiccolomondo.it.